The author imparts the fruit of decades of experience and observation as a passionate advocate of multicultural and intercultural unity and education. This read is such an eye-opener. It touched all aspects of humanity, what makes us different yet what makes us united. 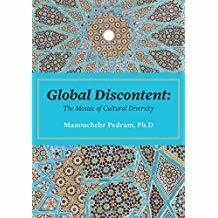 Author Manouchehr Pedram’s book “Global Discontent: The Mosaic of Cultural Diversity” presents an eye-opening, user-friendly guide to the many issues and crises the world is currently facing, or at times, neglecting and gives possible resolutions toward global unity. The book recognizes lifestyle, culture, nationality, race, religion, gender, gender identity, ability, sexual orientation, socioeconomic level, and belief system as the “global mosaic” of life that can fit together to form a harmonious and ideal world. This enlightening read is recommended for readers looking for literature that is filled with mind-blowing information on the causes of global discord and different facets of the “global mosaic” of life and how these different aspects fit together to bring about unity and community. This book will surely teach readers that looking past differences and focusing on similarities is a possible way to achieve an ideal and unified world. “Global Discontent: The Mosaic of Cultural Diversity” by Manouchehr Pedram has been selected as one of the many exceptional reads to be presented in the 2018 FIBF on October 10-14, 2018 in Frankfurt, Germany. Copies are available at Amazon (https://www.amazon.com/Global-Discontent-Mosaic-Cultural-Diversity/dp/1460293800) and Goodreads (https://www.goodreads.com/book/show/34006400-global-discontent). Manouchehr Pedram was a teacher and professor for 35 years in Midwest Kansas, Missouri, Colorado and Iowa. He attended the University of Kansas where he received his Ph.D. in Philosophy, and foundation of education with a minor in political science. He also finished a Law degree from the University of Tehran, Iran. His professional direction took a shift when he was offered by the Mid-Continent Regional Educational Laboratory in Kansas City to be part of a team to develop the Cooperative Urban Teacher Education (C. U. T. E.) program. Due to the program, he made involving teachers and students with diverse multicultural and intercultural community and interest in urban education his primary interest. He received the Kansas City Mayor’s World Citizen Award for his outstanding involvement in international and intercultural activities and his work in United Nations Association of greater Kansas City. He and his wife, Sara, received the Social Justice Award at the Unitarian Universalist Church in Kansas City and the Prairie Star (Midwest) region.